The snow has finally melted and probably stayed away for good (seven months), so it was high time to bring the grill out of hibernation and fire it up. One of the first things to make was this little beauty. Utilizing the Roasted Red Pepper and Gorgonzola Dip and the Caramelized Onions, you too can make this incredible sandwich! Synergy--it's a real life buzzword! This is the Italian Steak Sandwich-- a Tuscan-style sandwich with a base of lean steak grilled to pinkish medium rare perfection, sliced, and tossed with a seasoned oil. Then it is layered with greens, onions, and the Roasted Red Pepper and Gorgonzola Dip. It is all sandwiched between grilled Ciabatta rolls. The original recipe called for watercress, but I thought the peppery flavor of arugula would pair nicely with the meaty steak flavor. The original recipe did not call for onions, but I added caramelized red onions to add a note of sweetness to round out all the strong and savory flavors. These changes made for one delicious sandwich that I can't wait to make again. Preheat a charcoal or gas grill to medium-high heat. In a medium bowl, combine the oil, parsley, thyme, and rosemary, and pepper flakes if using. Season with salt and freshly ground black pepper. Brush grill with some of the oil. Season both sides of the steak with salt and pepper. Place the steak on the grill, cover, and cook for 5 minutes on each side for medium rare. Remove the steak from the grill and let rest for 5 minutes. While the steak rests, toast the rolls on the grill, cut side down, for 1-2 minutes. Thinly slice the steak across the grain and toss with the remaining seasoned oil. Place a handful of arugula on the bottom of the roll, top with the caramelized onions, steak, the Roasted Red Bell Pepper and Gorgonzola Dip, and the tops of the rolls. Cut in half and serve. Enjoy! This is my kind of sandwich! Love the Gorgonzola dip, and the caramelized onions put it over the top, bravo! Oh my goodness this look so darn good! The weather just got better around these parts so I think I shall pull out my grill asap and make this! Oh that sandwich looks really good! Wow, this looks AMAZING - I want this for dinner!! Love the use of gorgonzola & carmelized onions (always so delicious). I love a good sandwich. 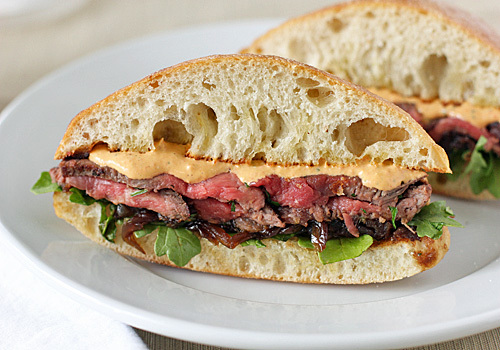 This sandwich looks good. My mouth is watering. Thanks for sharing!